New comics are due to hit the shelves on Wednesday so here’s a look ahead at some of the books we’ll be picking up this week. Click here for a list of the latest releases. Jo S: I've been trying hard to slim down my pull-list lately but call me Ado Annie because I'm just a girl who caint say no! Too much good stuff just jumps off the webpage for me currently so I'll have to leave the diet for another day. A couple of my series are drawing to a close this week: Man-Thing has been a quirky, kitschy delight and The Few, which took some time for me to ‘get’, has absolutely clicked for me now - I already feel like I'll miss this one. 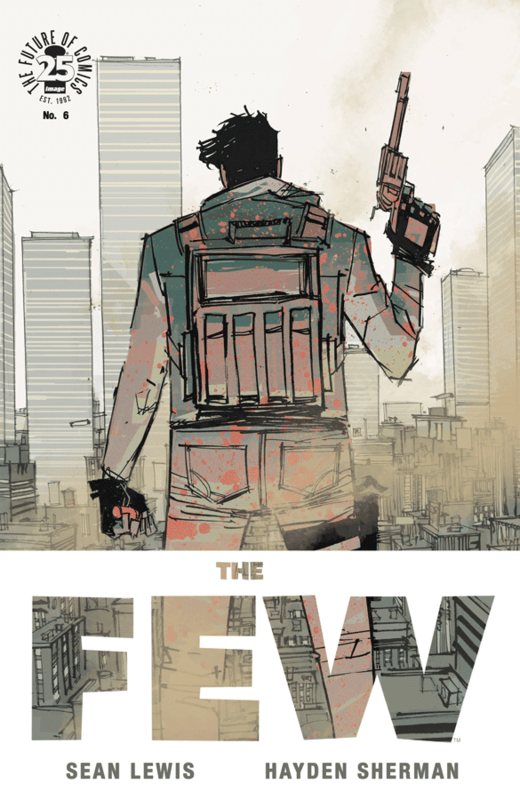 The stunning Forever War reaches its penultimate issue this week: the last chapter exhausted me with its deeply absorbing grimness; I'll need a stiff Tizer to hand when tackling this one. Three issue #1s make my cut this week: the premise for Swordquest #1 looks deeply silly but I'm a sucker for a tale of competitive '80s gamers still trying to keep their dream of world celebrity, based on being the best at an obscure cabinet game, alive (watch King Of Kong if you haven't). Also on the nostalgia kick comes Bill & Ted Save The Universe #1. We've just introduced our 12 year-old to the B&T phenomenon (air guitar riff break) and I'm hoping to inspire him to consider the comics medium as another way of accessing tales of his new heroes, at least until they make another movie! I couldn't resist the Wonder Woman/Tasmanian Devil Special - frankly I can't imagine anyone could - so that little sugary fancy has upped my comics calorie count this week too. As Mother advised, I'm keeping regular too, with fibre provided by X-Men: Gold #6, Batwoman #4 and the intriguing Royal City #4 but to her horror, I'm sure, I shall also be scoffing the entire box of pink-frosted, sprinkle-coated, Holes-n-More donuts that is Plastic #3 between meals. Tom P: You'll need your sunglasses this week if you plan to read your new comics outside. The country is enjoying record temperatures so grab a cold one, kick back and enjoy. First choice as I sit back in my deck chair will be a cool beer swiftly followed by the excellent Royal City #4. Jeff Lemire has been belting out some great comics recently. This week's issue sees a delicate balancing act that has been keeping the fragile lives of each Pike family member aloft comes crashing down. Eek! Poor Pikes. The only other title I'll be bringing home is Mighty Thor #20. After all the intergalactic Phoenix fun of the last arc, Arron links the series up with his Unworthy Thor mini and we meet the new Ultimate Thor... War Thor! That's a whole lotta Thor! I'll need another beer.